This report documents the one day seminar 'Beyond Prison Walls: Conversation on Prisoner’s Rights ' organised by Tihar prisons in collaboration with Bureau of Police Research and Development (BPR&D), Commonwealth Human Rights Initiative (CHRI) and Delhi School of Social Work (DSSW), on 23 September 2017. This note presents Commonwealth Human Rights Initiative’s (CHRI) analysis and recommendations on the latest draft notification constituting the Police Complaints Authority for the National Capital Territory of Delhi. The draft notification was submitted to the Delhi High Court by the Office of the Lieutenant Governor based on which the analysis and recommendations have been prepared. 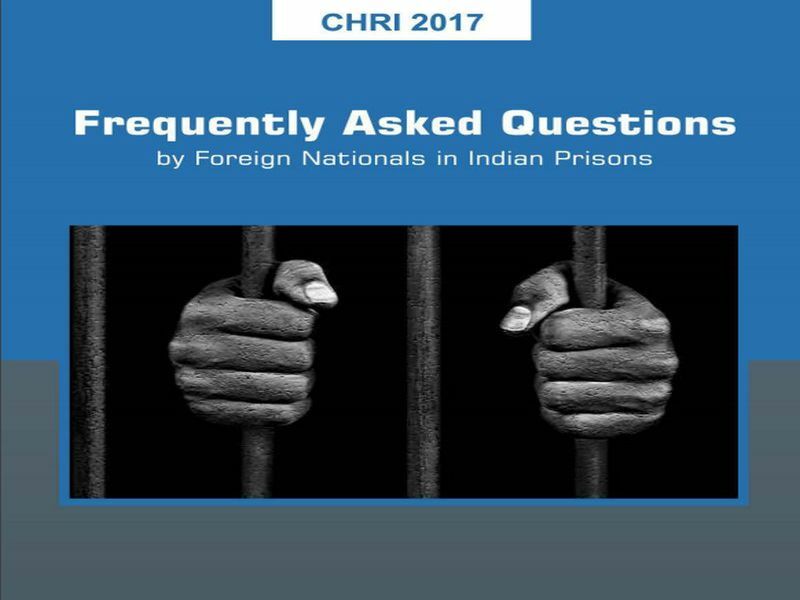 We have recently developed a pamphlet for foreign nationals detained in Indian prisons. It comprises of basic information of what to expect inside prison, information about availing legal aid, information about visits from family members, and primarily it comprises of contact details on all the embassies in India. By Basant Rath (The Wire) The 73-page report was titled ‘8 Hours Dream of Police’. Constable Ravindra Pandurang Patil of Mumbai police had, in his 17 years of service, sent the same report to successive police commissioners. 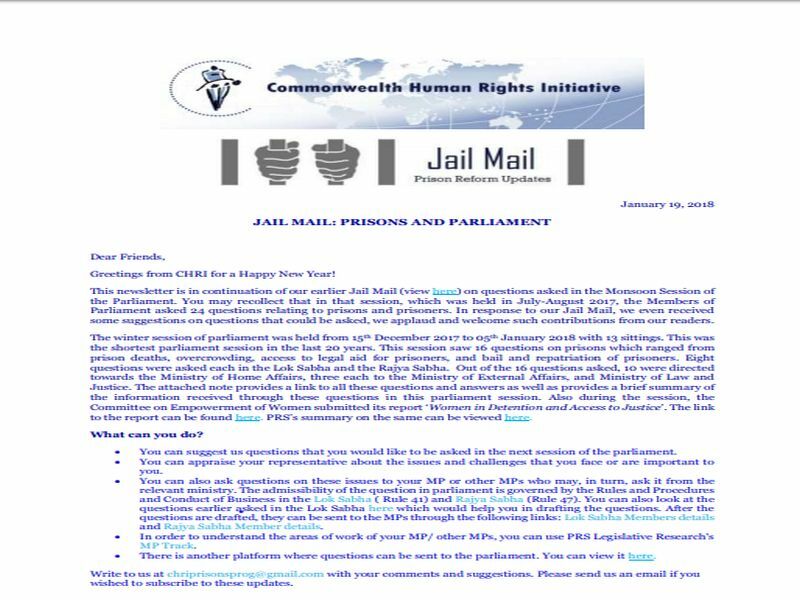 This newsletter is in continuation of our earlier Jail Mail (view here) on questions asked in the Monsoon Session of the Parliament. You may recollect that in that session, which was held in July-August 2017, the Members of Parliament asked 24 questions relating to prisons and prisoners. 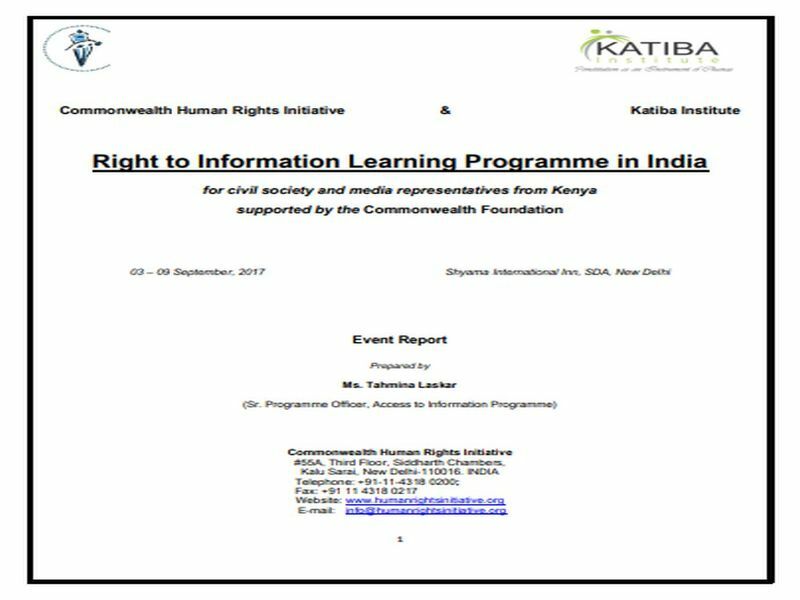 CHRI organized an RTI Learning Programme in New Delhi, India for six delegates representing civil society and media organisations in Kenya in September 2017, with the support of the Commonwealth Foundation. A report. "The Prison Reforms Programme of Commonwealth Human Rights Initiative (CHRI) organised a one-day workshop on 18 th December at Floatel, Kolkata, West Bengal on ‘Welfare Behind Bars: Recent Developments’. Six civil society organisations have written to the Delhi Police leadership to urgently resume monthly meetings held between the police and women and child rights groups. Held regularly from 2013 to 2016, only three meetings have been held in 2017, the NGOs said in the letter. CHRI’s Access to Information Programme (ATI) team attended the 12th Annual RTI Convention organized by the Central Information Commission (CIC) on Wednesday in New Delhi. Venkatesh Nayak, Programme Coordinator of ATI, made a presentation on some examples of good practices of proactive information disclosure. Vice President Mr M.